JPMorgan Chase and Fifth Third Bank are investing $5.5 million in a new fund designed to boost minority entrepreneurs on Chicago?s South and West sides. ?If it?s replicable, we want to do it everywhere,? Chase Chairman and CEO Jamie Dimon said. ?We can?t do it overnight, but you?re going to see it expand.? The overall investment from Chase ? $4 million ? is part of the bank?s commitment to invest $40 million in historically underserved South and West Side neighborhoods. Chicago is the fourth city where Chase is setting up an Entrepreneurs of Color Fund. The concept got its start in 2015 in Detroit as a partnership between Chase, the W.K. Kellogg Foundation and the Detroit Development Fund. The Detroit fund tripled in size to $18 million last year, and Chase announced similar funds in San Francisco and New York?s South Bronx area earlier this year. Chase is investing $3 million in the Chicago fund, and Fifth Third, which also contributed to the Detroit fund, will invest $2.5 million. Fifth Third funds similar initiatives on its own, but it was happy to partner with a competitor, said Eric Smith, the Cincinnati-based bank?s regional president for Chicago. ?There are opportunities to compete when looking for clients and business opportunities, but when it comes to investing in the community, I don?t think there?s any competition,? Smith said. ?Capital, plus technical assistance and mentoring, we feel is a great way to strengthen neighborhoods by providing jobs and much-needed services,? she said. Chase and Fifth Third?s local partners in Chicago and Detroit were already providing coaching and capital to business owners who struggle to qualify for more traditional bank loans. But Brad McConnell, CEO of Accion, said the nonprofit lender doesn?t have the funds to reach all the business owners who could put the money to good use. ?There?s an enormous amount of additional entrepreneurs trying to build good businesses in tough neighborhoods we?re not reaching but could with additional capital,? McConnell said. 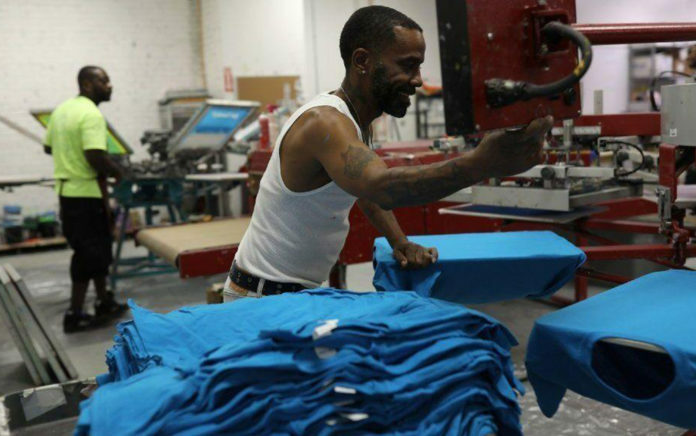 Vernita Johnson, owner of DLV Printing Service in Chicago?s South Austin neighborhood, said she found that mentoring valuable even though she?d been in the screen printing and embroidery business for about 20 years when she sought her first loan from Accion. Johnson borrowed $25,000 three years ago to purchase a new embroidery machine. ?It took the business to another level,? she said. ?We started having staff meetings every Monday like clockwork and doing things we probably should have been doing all along.? ?That?s why it took 20 years to get to a certain level,? she said. ?You struggled more to get to the same point.? Dimon said Chase?s experience in Detroit showed the importance of the extra services and hands-on help. ?Whether it?s help with contracts or a business plan, there are a whole bunch of other things we can do to help them get going,? he said. ?Considering the risks we take, that?s pretty reasonable,? said Ray Waters, president of the Detroit Development Fund, which partnered with Chase. ?If it were lower, I?d think we were not taking enough risks.? It was a major opportunity, with one problem: Benkari didn?t have deep enough pockets to cover payroll, benefits and other upfront costs before receiving payment for its work, said Adrienne Bennett, the company?s president and CEO. Bennett had tried to get a line of credit once before, but one bank turned her down and another wouldn?t agree to a large enough loan. This time, she went to the Detroit Development Fund, which recommended the Entrepreneurs of Color Fund. ?It just took us to a totally different level,? Bennett said. ?General contractors are looking at us in a way they never did before.? Johnson said she?d previously passed up opportunities because she didn?t have the equipment to handle bigger jobs or couldn?t afford to tie up cash in materials while waiting to be paid for the finished product. ?If people knew there was help for things like that, it would change their business and change their mindset about their business,? she said.